Twenty-five years ago, in 1993, Truffle Brothers Ali and Murat learn about the existence of Magic Mushrooms. Inspired, they start production a year later, using second-hand aquariums. Soon enough however, it becomes apparent that this method won’t be sufficient for long if they want to keep up with demand. The Truffle Brothers start professionalizing their production line and in the years that follow, they repeatedly move to bigger places with more room to grow their special organisms. Mycologics, as the brothers would later name their company, soon turns into the world's first large-scale producer of Magic Mushrooms. Mycologics experiences many highs over the years, but of course there was also the occasional setback. The legal ban on Magic Mushrooms in 2008 meant that a number of drastic changes had to be made. From this moment Mycologics fully focusses on the production of Magic Truffles, which are fortunately not included in the mushroom ban. Nowadays, Mycologics is no longer the only producer of psychoactive truffles, but if you want to be certain of quality and safety, be sure to opt for the one and only Magic Truffles, which are the product of twenty-five years of experience. Twenty-five years of experience in growing psychoactive mushrooms and truffles has taught us a lot. It enabled us to fine-tune and perfect the growing process. The result is that our final products are always of the highest possible quality. In addition to this, we’ve chosen to produce our Magic Truffles according to general standards for food safety. At Mycologics, we also work with a so-called HACCP plan, which is short for Hazard Analysis and Critical Control Points. 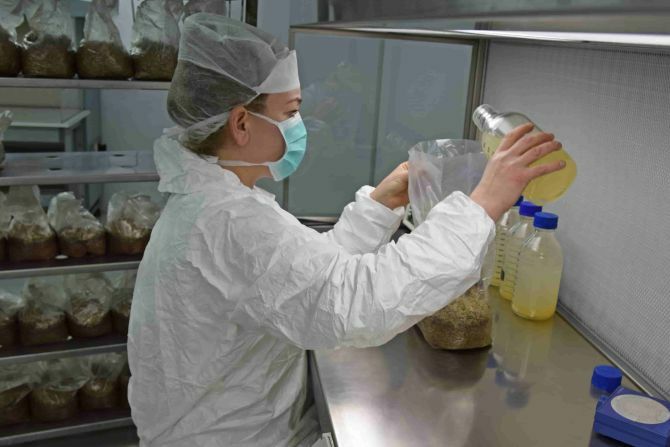 In practice, this means that we have mapped out where in our production process there are risks for the safety of our Magic Truffles (for example contamination with bacteria) and that we have taken measures to minimize these risks (such as clean rooms and working with gloves). In addition, we constantly monitor these points. By doing registrations, we also keep track of everything that happens in the production process. Working according to this plan guarantees that you get an excellent product, of which the safety and quality are guaranteed. As a producer with years of experience in growing psychoactive mushrooms and truffles, we feel responsible for the product that we offer to our customers. We therefore not only guarantee the quality and safety of our products, but also want to provide our customers with useful information. We are convinced that Magic Truffles can be used safely by adults who’ve been properly informed in advance. Our information brochure "All you need to know about Magic Truffles" is therefore freely available to everyone. The information from this brochure can be found on our website in six different languages. In addition to that, there is a printed version in which eleven languages are included. Smartshop visitors always receive the brochure with their Magic Truffles. In addition to information about what Magic Truffles are, the recommended dosage and the effects that a user can expect, the reader of the brochure also finds information about shelf life and a number of important safety precautions. Our Magic Truffles are completely legally produced in the Netherlands. Earlier we mentioned the so-called mushroom ban of 2008. With this prohibition, more than one hundred mushroom species were banned overnight. Magic truffles however, are technically and scientifically different from mushrooms. For this reason we can freely produce and sell our Magic Truffles in the Netherlands (although we naturally comply with the requirements of the Netherlands Food and Consumer Product Safety Authority). There is also demand for our products from abroad. In other countries, however, legislation is not always completely clear, often due to a lack of case law. It is impossible for us as a company to constantly stay up-to-date on the changing legislation in other countries. The responsibility for the purchase of our products therefore lies with the buyer. Before you order, check whether you can legally import our products into your country. We produce and sell natural products. Many people who’ve consumed Magic Truffles experienced a deep admiration and appreciation for nature during (and after) their trip. Therefore, it goes without saying that we produce our Magic Truffles in the most sustainable way possible. For the production of our truffles we use no harmful pesticides or artificial gimmicks, we simply let nature do its work. In addition to that, we take measures where possible to make our production process more sustainable. For example, increased production has enabled us to reduce our use of packaging materials by more than halve. As a result, we produce less waste, we use less cooling space and less transport is needed, with reduced CO₂ emissions as a result. Mycologics focusses exclusively on the production of Magic Truffles. Our goal is to offer every adult who is looking for a psychedelic experience a safe product of high quality. We do this using our twenty-five year long experience with psychoactive mushrooms and truffles. This experience enables us to deliver products that come from a fully optimized process,in which both food safety standards and the best possible quality truffles are taken into account. In addition to this, we see it as our responsibility to provide our customers with all information relevant to the use of our products. We strongly belief that well-informed adults should be allowed to make their own decision on whether or not they want to consume our products. From the feedback we have received from our customers over the years, we know that our products often produce very positive and enriching experiences. In addition to that, it has been proven time and time again that the risks associated with the consumption of our products are minor, especially when they are used in a responsible manner. Therefore, it is our goal to remain the ideal middleman between this highly special gift of nature and the people who are interested in what Magic Truffles have to offer.